Deputy Holmes and Enzo are new recruits for the Shoreline Police and the King County Sheriff’s Office. 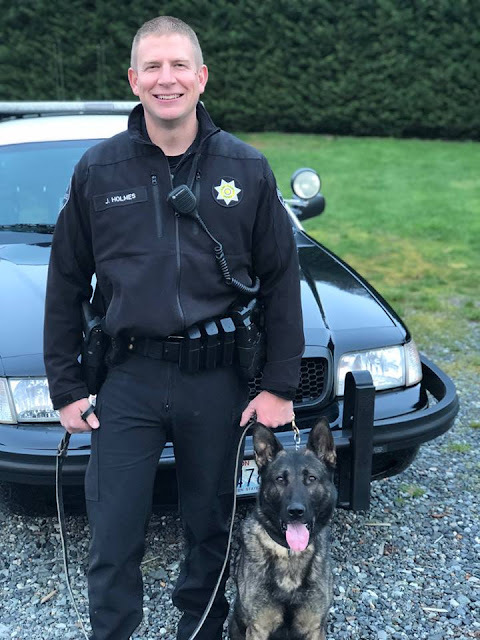 Deputy Holmes, K9 Recruit Enzo’s handler, was raised in the Shoreline area and is a graduate of the Shoreline Public School District (Ridgecrest Elementary, Kellogg Middle School and Shorecrest High School). Deputy Holmes also attended Shoreline Community College. He is an 11 year law enforcement veteran. K9 Recruit Deputy Enzo is a 2 ½ year old German Shepherd who was imported from Germany by Alderhorst International (a canine vendor in Riverside, CA). Enzo was selected by the Sheriff’s Office after rigorous testing (temperament, courage, medical evaluation, etc). It was clear from the get-go Enzo has the qualities the Sheriff's Office requires from our police service dogs.